All Gates TX wiper blades feature a rugged metal construction with a durable natural rubber wiping element for reliable performance under demanding conditions. This aerodynamically designed blade is able to achieve constant screen contact with very large windscreens. Consisting of twelve part numbers, the TX range is available with a series of ‘easy to use’ adaptors to enable an extensive coverage of more than 96% of commercial vehicle applications in Asia. Heavy duty truck and bus fleet owners will change their windscreen wipers regularly to protect the safety of the driver and their passengers. Don’t pass up on this excellent sales opportunity and stock up Gates TX blades now. All Gates TX wiper blades feature a rugged metal construction with a durable natural rubber wiping element for reliable performance under demanding conditions. 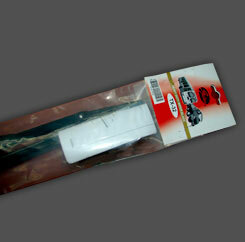 This aerodynamically designed blade is able to achieve constant screen contact with very large windscreens. Consisting of twelve part numbers, the TX range is available with a series of ‘easy to use’ adaptors to enable an extensive coverage of more than 96% of commercial vehicle applications in Asia. Heavy duty truck and bus fleet owners will change their windscreen wipers regularly to protect the safety of the driver and their passengers. Don’t pass up on this excellent sales opportunity and stock up Gates TX blades now.